It was 4 o'clock in the morning, and the sky had barely crept over the horizon in the small town of Chenqiao in Yingshang county, Anhui Province. 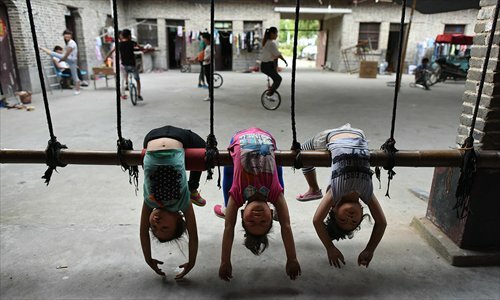 In a courtyard house which is now used as an acrobatics school, Song Yujiao, a 48-year-old woman, broke the peace and serenity by yelling "Wake up! Wake up!" and knocking on the building's doors one by one. Soon, lights were turned on, and students, only half awake, dragged themselves out of bed to start their day's training. 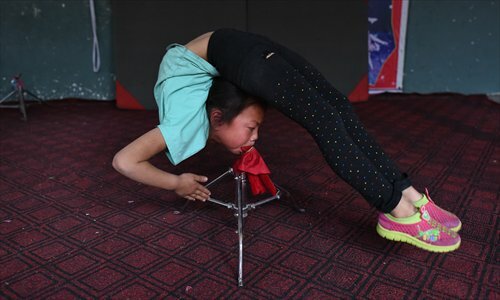 Song and her husband Miao Honghu, 49, both former acrobats, opened the school seven years ago as they found they were getting too old to perform. "The rural performance industry has been booming these years, and more people are coming to learn acrobatics. This trade gets to be passed on to younger generations," Miao said. Their son and two daughters are all acrobats. Even their grandson, who just turned 5, is picking up the trade. After three hours of training, the students will have a one-hour breakfast break, before another session starting at 8 o'clock. Their living conditions are poor - each room accommodates up to 20 children, with three to four sharing one bed. But none of these puts off the over 100 people, hailing from Anhui, Henan and Shandong provinces, from attending the school. The youngest pupil is only 4 years old, while the oldest is over 40. Some come as a family, such as 30-year-old Fan Guangrong, his wife and their two children, hailing from Yongcheng, Henan Province. The couple make a living by performing at weddings, funerals and ceremonies in their village, and this is the second time they have come to the school to hone their acrobatic skills. Now they want their children to join them. 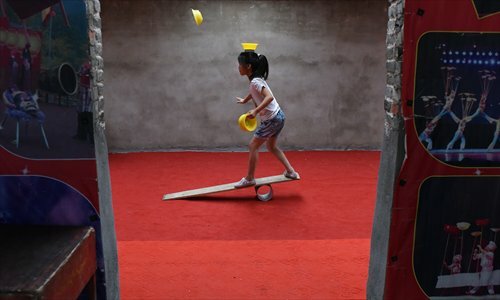 "Now even I can make money from performing," said their son Fan Jiahong, aged 9, who's learning unicycling at the school. Fan said he and his wife can earn over 500 yuan for each show. "It's a demanding job, but it's so much better than being a migrant worker. We have more freedom," he said. Fan's children are among the lucky few who have their parents accompanying them at the school. Most children come here alone. Xu Xingxing, aged 7, couldn't control her tears as she stretched her legs. Her mother just called Song Yujiao, asking to extend her daughter's stay at the school by another month. Xu was devastated. "She lied to me. She said I only need to be here for one month," she said, overwhelmed by the loneliness and rigid training.